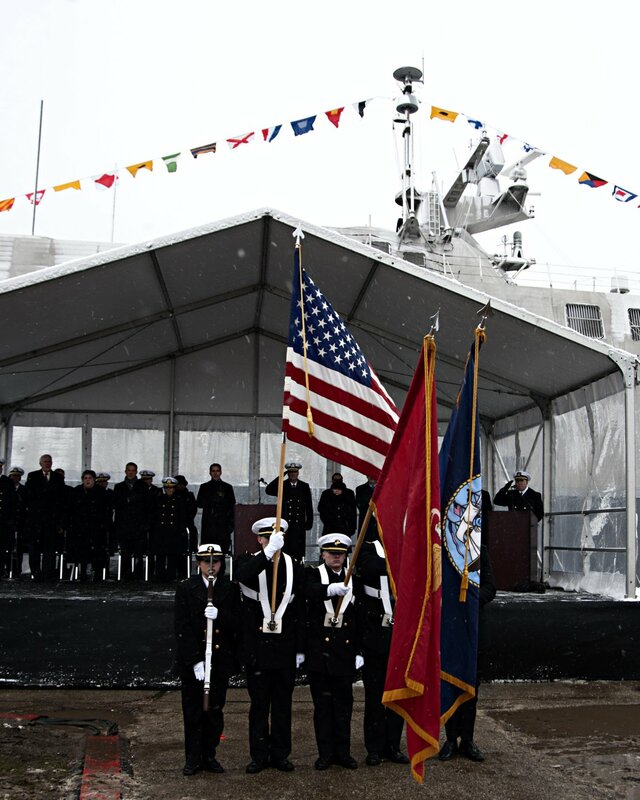 18 August 2011: Fabrication commenced at Marinette Marine Shipyard, Marinette, Wis.
21 November 2015: Commissioned at Milwaukee, Wis., Cmdr. 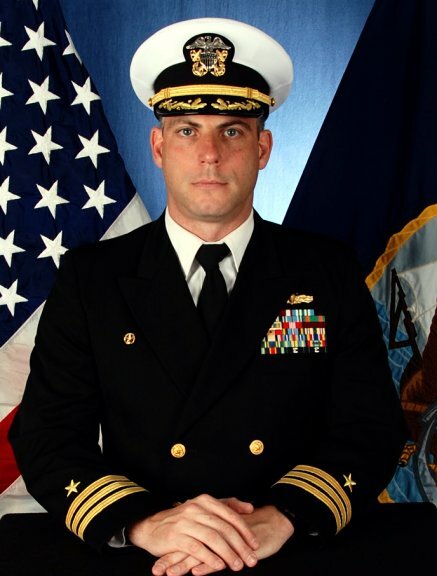 Kendall G. Bridgewater (LCS Crew 104) in command, assigned to LCS Squadron 1 at San Diego, Cal. 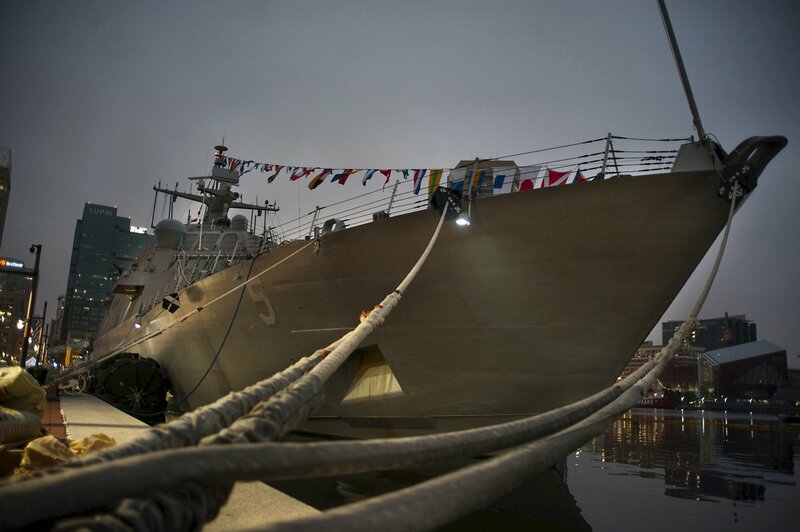 11 December 2015: While enroute to her homeport of San Diego, Milwaukee suffered an engineering casualty to the combining gears and had to be towed to Little Creek, Va.
04 & 19 September 2016: Conducted full ship shock trials (FSST) rehearsal; conducted the first FSST test, 100 miles northeast of Ormond Beach on 04 Sep.; underway for the second test on 19 Sep.
"Milwaukee, The Ship" - "Milwaukee, The People"
688k 17 December 2013: Marinette, Wis. - Two views of the littoral combat ship Pre-Commissioning Unit Milwaukee (LCS 5) being prepared for its christening ceremony on 18 December at the Marinette Marine Corporation shipyard. 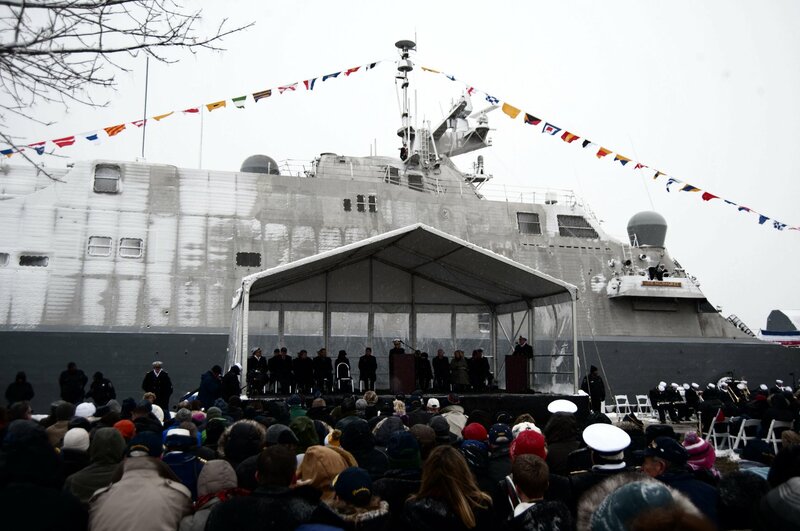 159k 18 December 2013: Marinette, Wis. - The littoral combat ship Pre-Commissioning Unit Milwaukee (LCS 5) slides into Lake Michigan during her christening ceremony at the Marinette Marine Corporation shipyard. 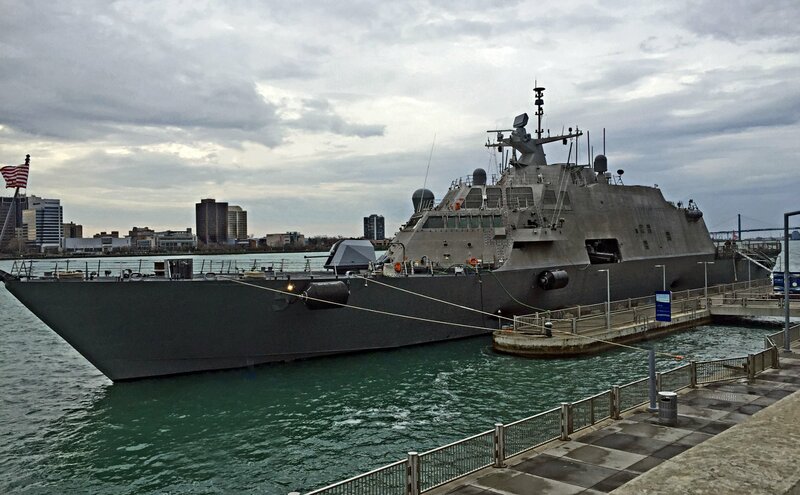 297k 18 September 2015: Lake Michigan - A three view series showing the future USS Milwaukee (LCS 5) on her Acceptance Trials. 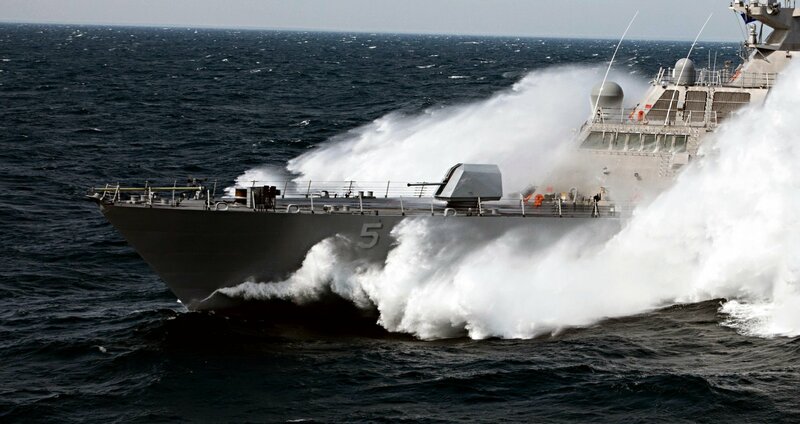 Slicing its way through the choppy waters of Lake Michigan, the future USS Milwaukee passed its final test, earning high marks and a thumbs-up from the U.S. Navy after successfully completing its acceptance trial on 18 September. 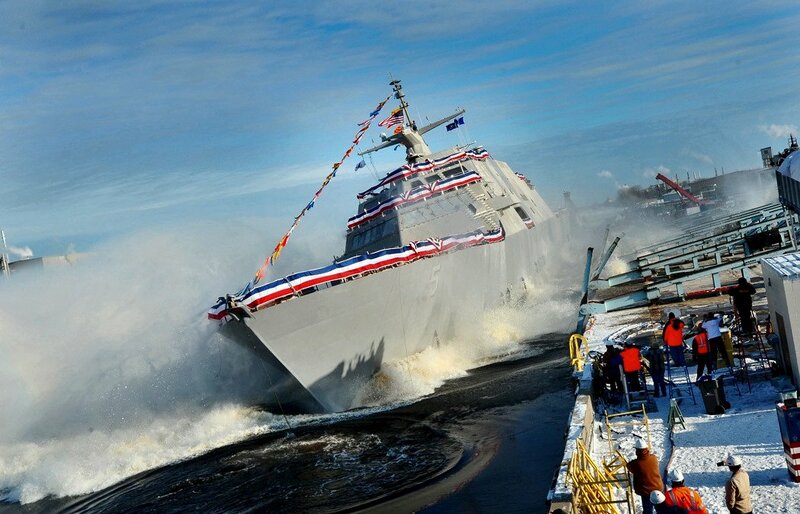 316k 14 November 2015: Marinette, Wis. - The future USS Milwaukee (LCS 5) departs Fincantieri Marinette Marine shipyard for the last time as LCS crew 104 guides her to Lake Michigan. 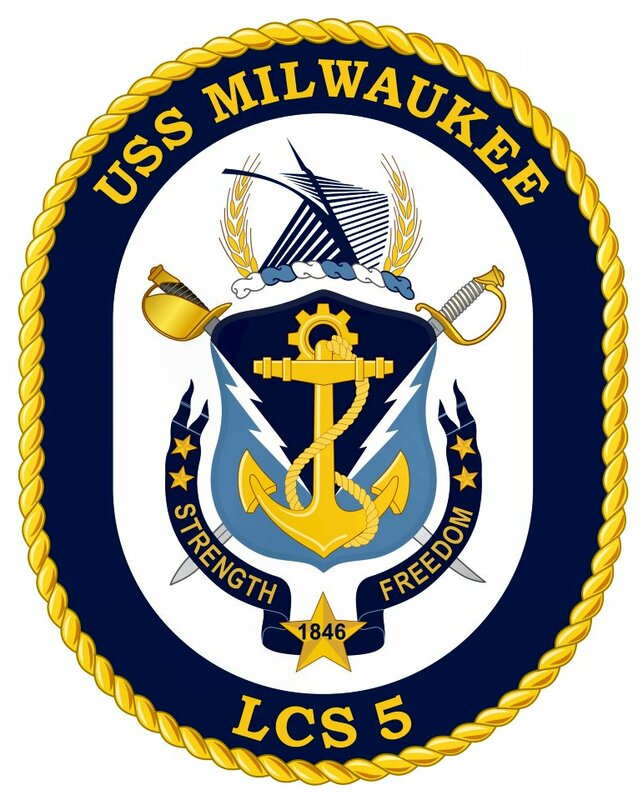 The Milwaukee, built by the Lockheed Martin-led LCS industry team, will be commissioned by the Navy at her namesake city November 21. 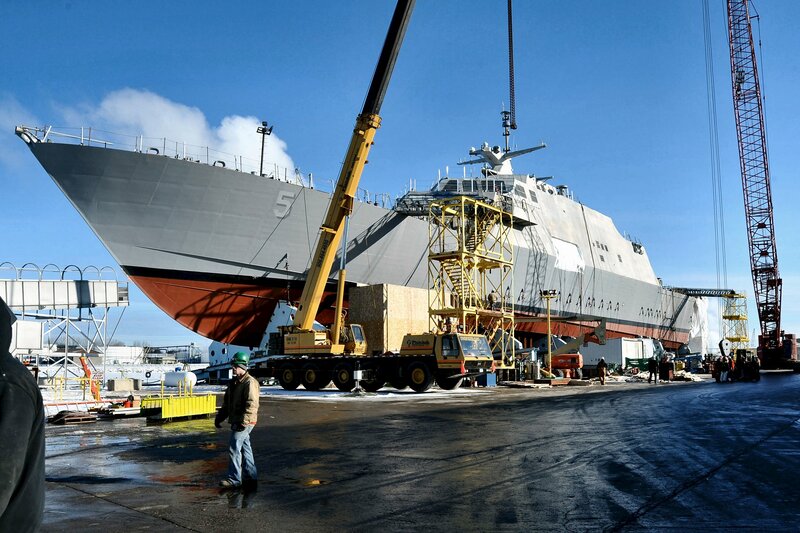 She will join her sister Freedom-variant littoral combat ships, USS Freedom and USS Fort Worth, in the Fleet. 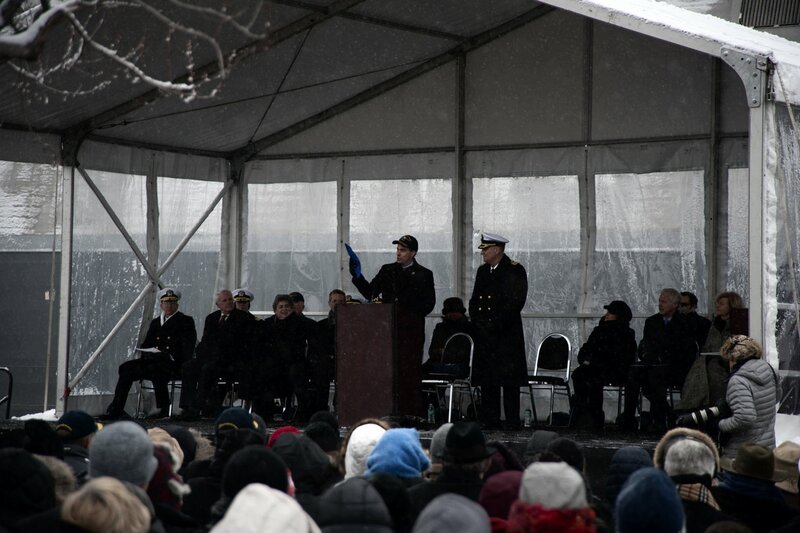 261k 21 November 2015: Milwaukee, Wis. - Members of the Navy Honor Guard present the colors during the National Anthem at the commissioning of USS Milwaukee (LCS 5). 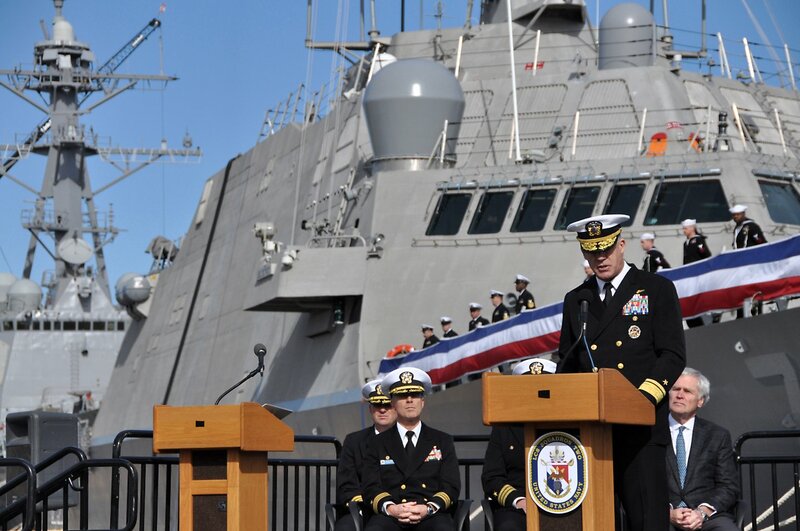 280k 21 November 2015: Milwaukee, Wis. - Vice Chief of Naval Operations Adm. Michelle Howard speaks during the commissioning of USS Milwaukee (LCS 5). 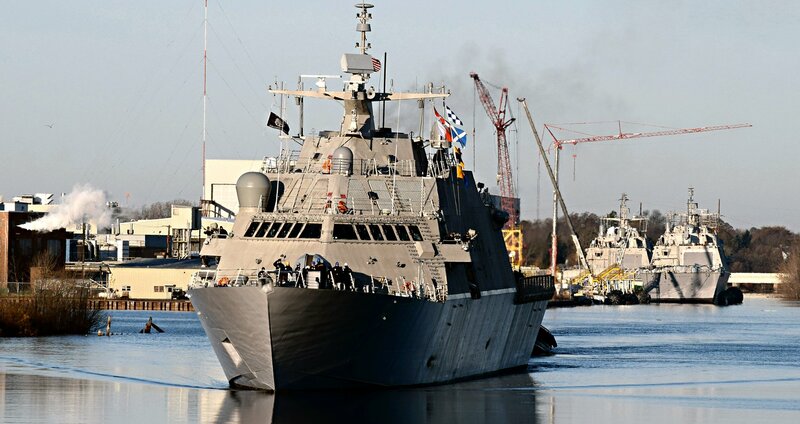 USS Milwaukee, the third Freedom variant littoral combat ship, is designed to operate in shallow and coastal waters throughout the world. 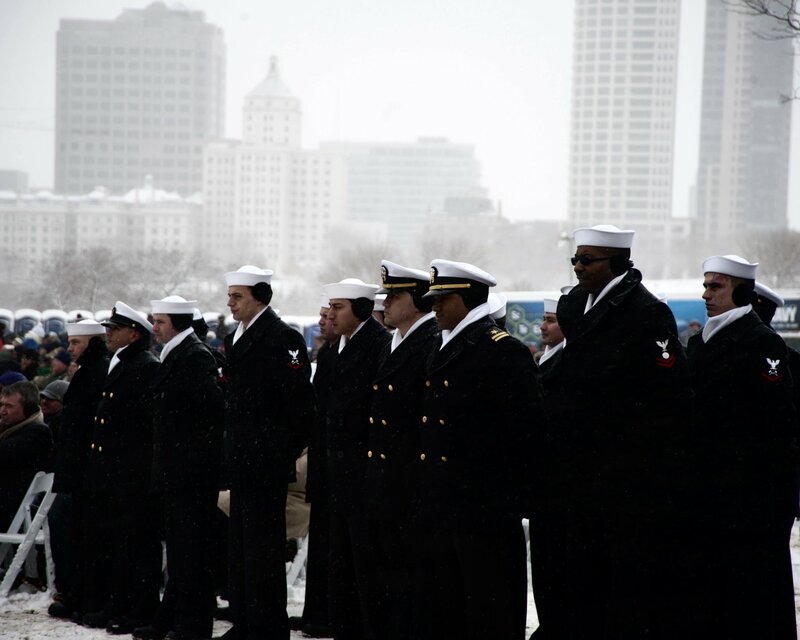 233k 21 November 2015: Milwaukee, Wis. - Sailors from USS Milwaukee (LCS 5) stand in formation during the commissioning of the ship. 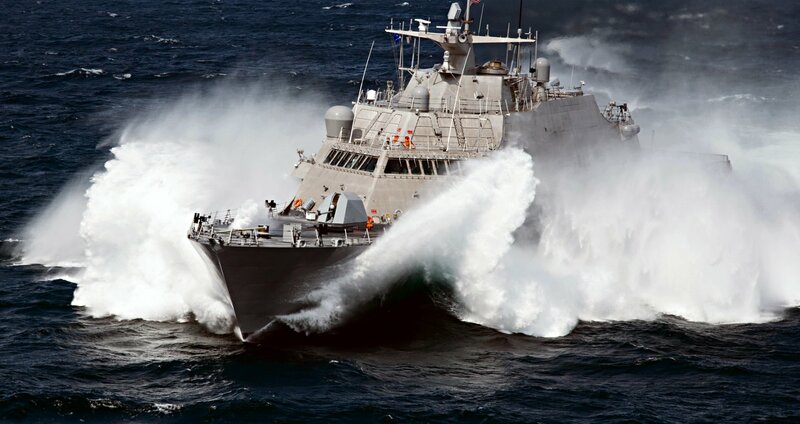 USS Milwaukee, the third Freedom variant littoral combat ship, is designed to operate in shallow and coastal waters throughout the world. 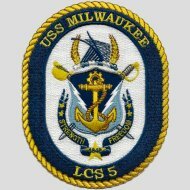 364k 21 November 2015: Milwaukee, Wis. - Wisconsin Governor Scott Walker presents a flag of Wisconsin to Cmdr. 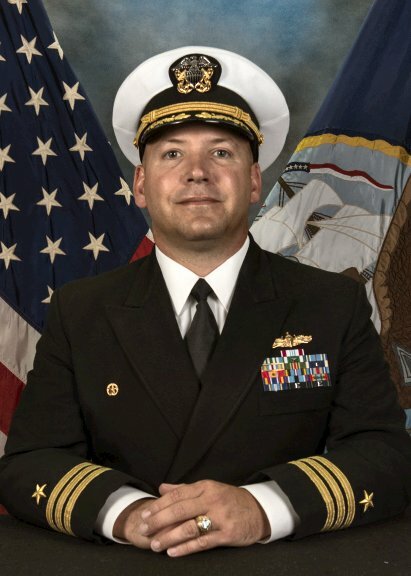 Kendall Bridgewater, commanding officer of USS Milwaukee (LCS 5), during the ship's commissioning ceremony. 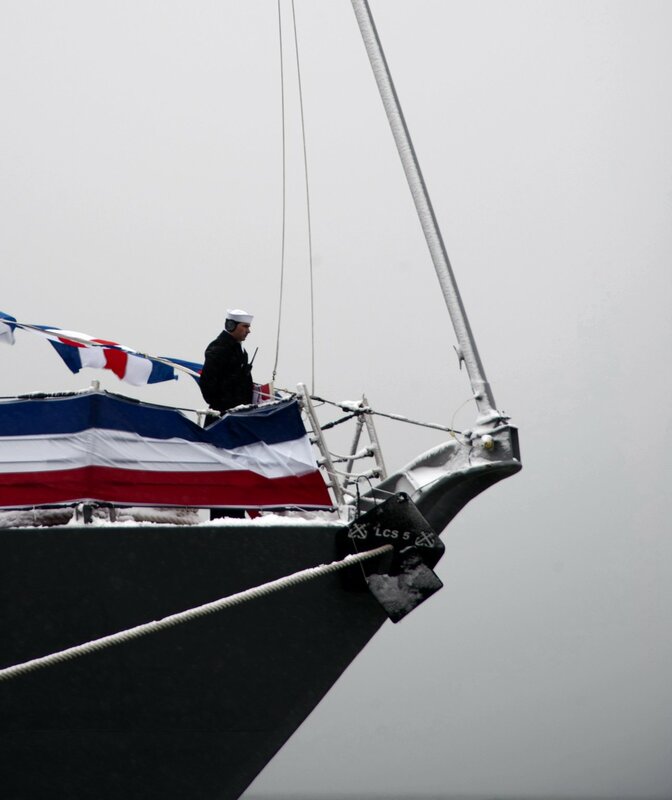 133k 21 November 2015: Milwaukee, Wis. - A sailor stands ready to hoist the ship's colors during the commissioning of USS Milwaukee (LCS 5). 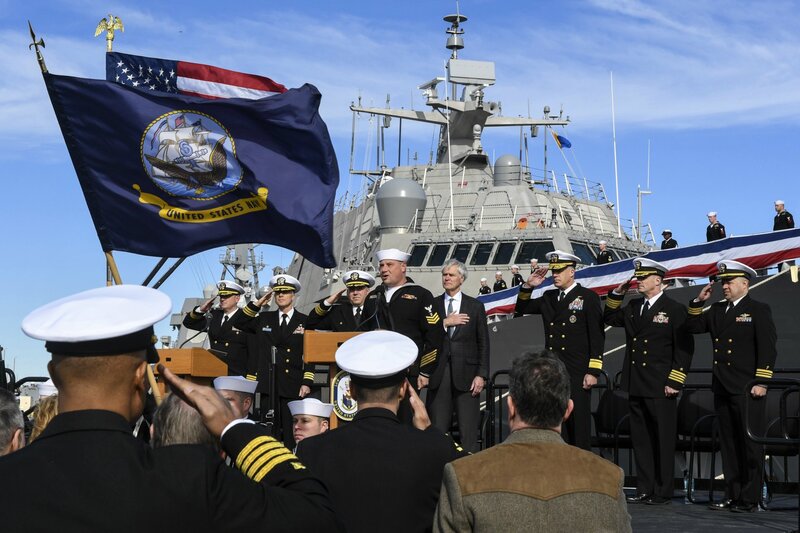 202k 21 November 2015: Milwaukee, Wis. - Sailors man the rails of the newly commissioned USS Milwaukee. 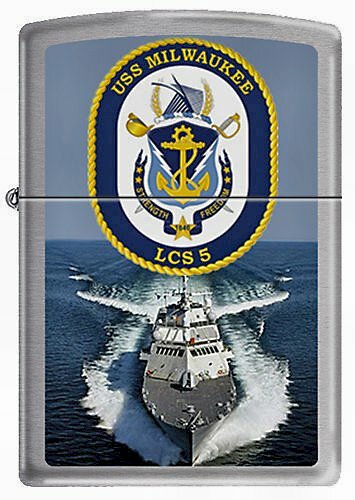 359k 25 November 2015: Detroit, Mich. - The littoral combat ship USS Milwaukee (LCS 5) during a visit to Detroit, Michigan, for a brief stay en route to shake-down cruise and operational patrols in the South China sea. 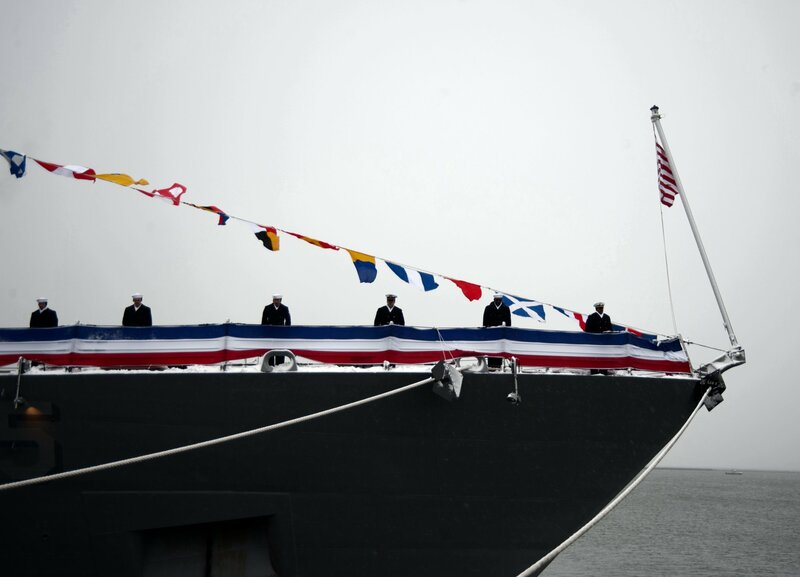 On her bow standard Milwaukee flew the traditional Navy Jack. 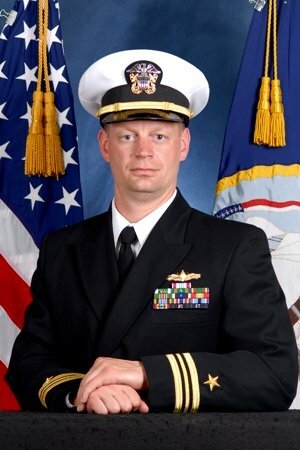 This unique flag with its rattlesnake on striped field, reminiscent to but different from the Gadsden Flag, is flown from the jackstaff of commissioned vessels of the U.S. Navy while moored at a dock. 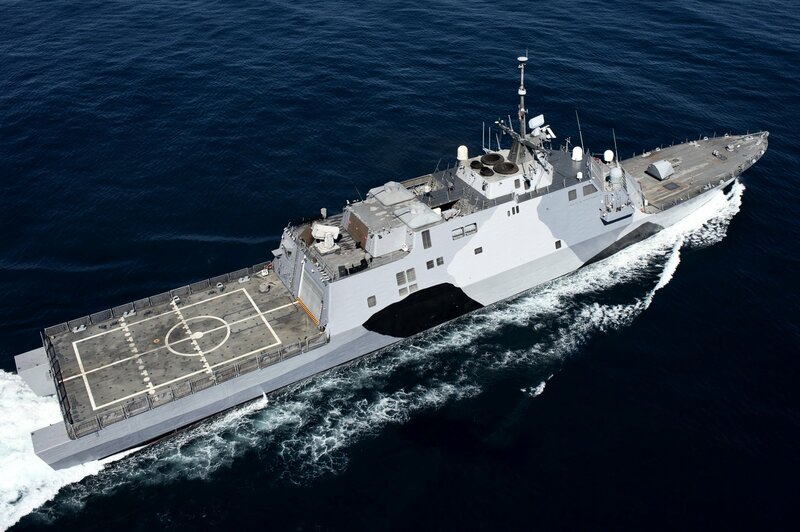 506k undated: location unknown - an undated aerial overhead shot of the Littoral Combat Ship USS Milwaukee (LC-5) underway, location unknown. 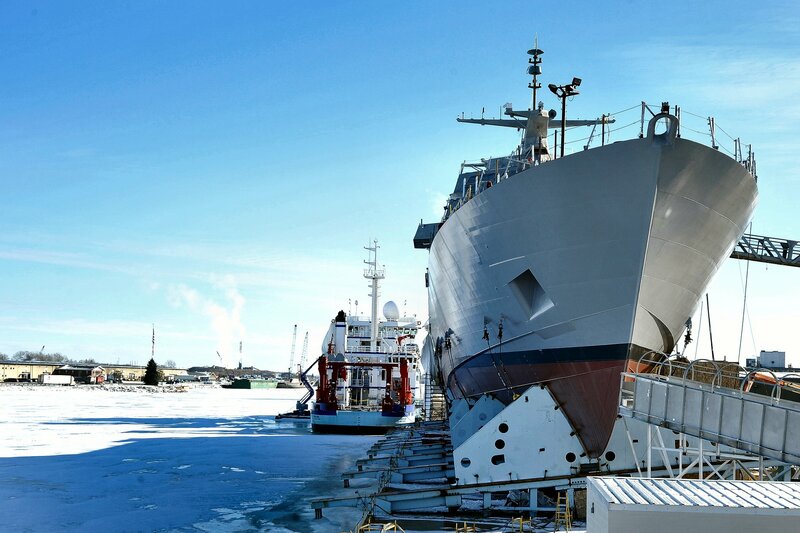 Note the distinctive camouflage scheme worn in this image reminiscent of wartime German raiders. 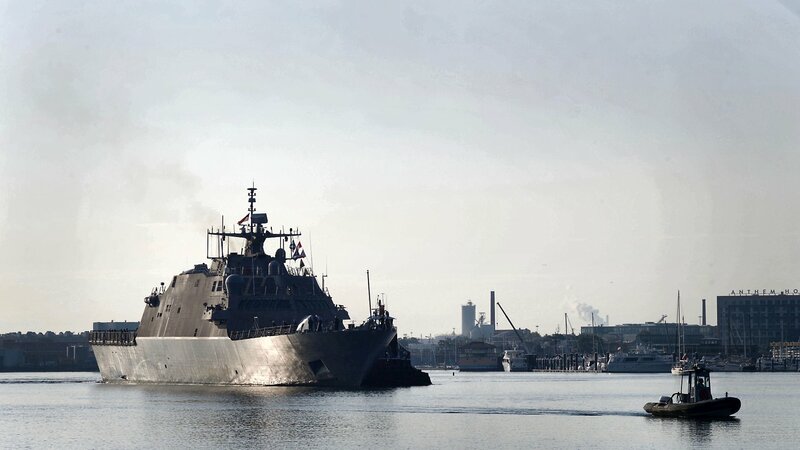 243k 19 February 2016: Jacksonville, Fla. - Freedom-variant littoral combat ship USS Milwaukee transits Naval Station Mayport Harbor on its way into port for a maintenance period. 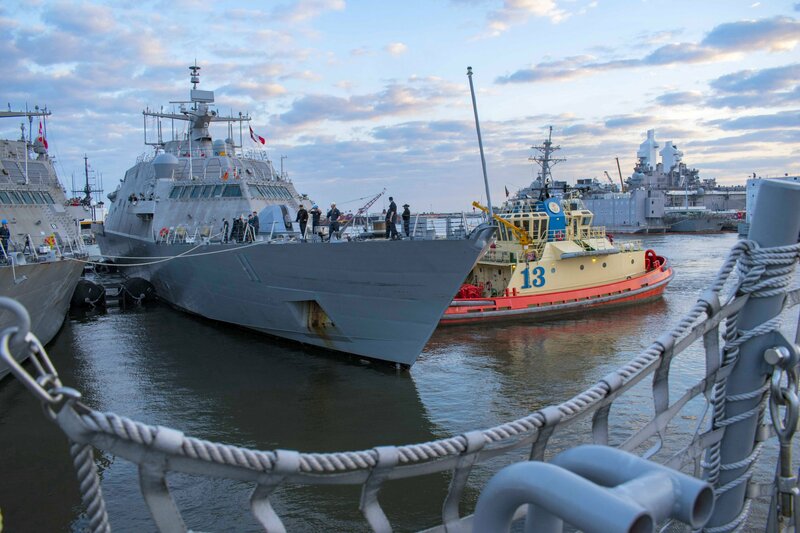 While in Mayport, it will take on equipment for underway testing this spring, before eventually arriving in its San Diego homeport. 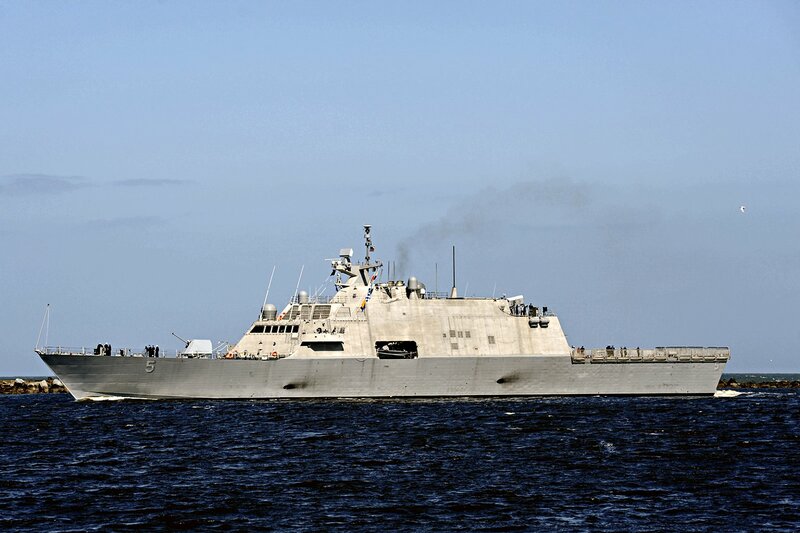 267k 08 June 2016: Jacksonville, Fla. - Freedom-variant littoral combat ship USS Milwaukee (LCS 5) transits out of Naval Station Mayport after a maintenance period. 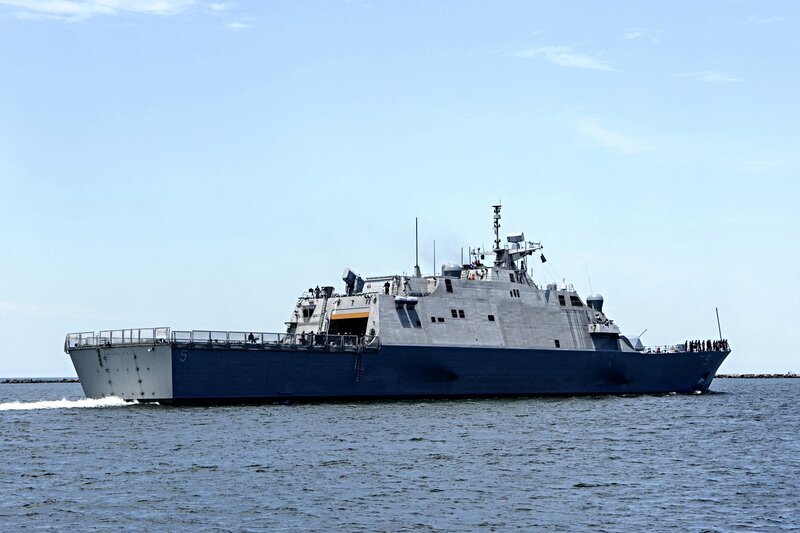 213k 04 September 2016: at sea off Mayport, Fla. - USS Milwaukee undergoes "Full Ship Shock Testing". 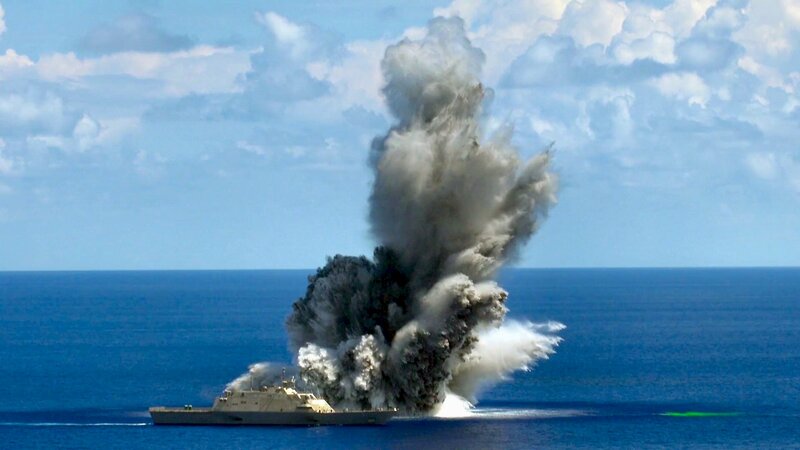 The Navy detonated the bomb under the Milwaukee at 4:29 p.m. Sunday, which the Geological Survey reported happened about 103 miles east-northeast of Flagler Beach and 106.6 miles east-northeast of Ormond Beach. 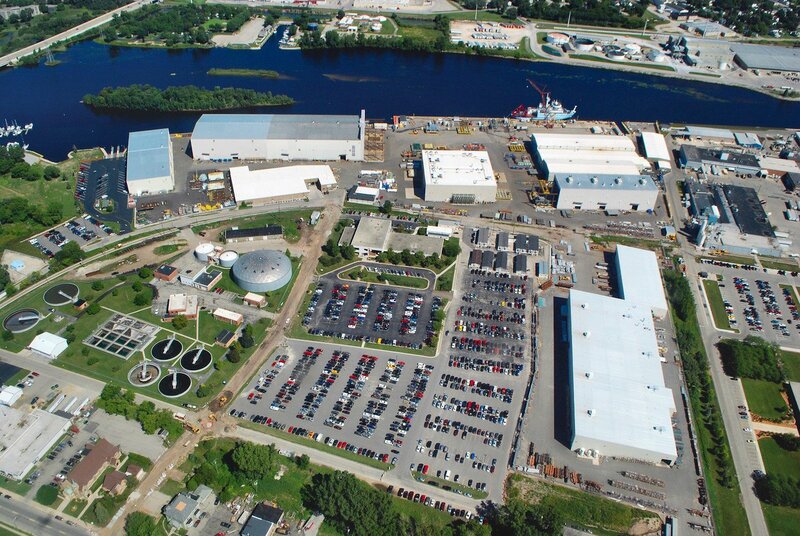 Within the next four minutes, sound waves rippling through underground layers of rock registered the explosion as a 3.8 magnitude earthquake on Geological Survey seismographs as far away as Kansas, said Paul Caruso, a geophysicist at the National Earthquake Information Center. 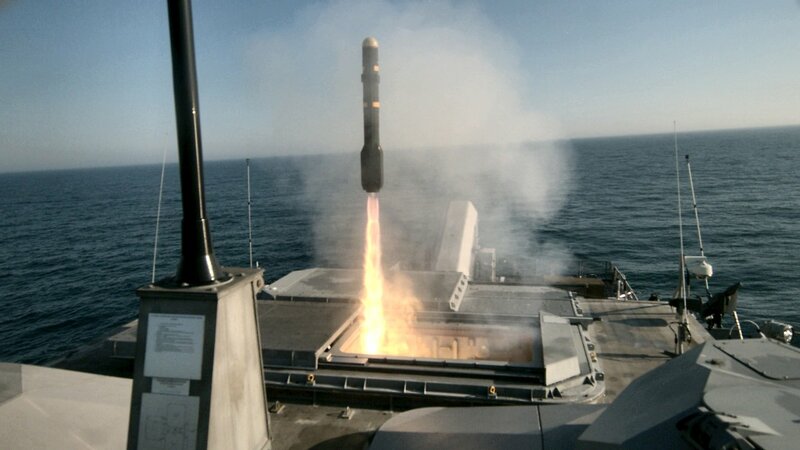 132k 11 May 2018: the Atlantic Ocean - The Freedom variant littoral combat ship USS Milwaukee fires an AGM-114L Longbow Hellfire missile during a live-fire missile exercise off the coast of Virginia. 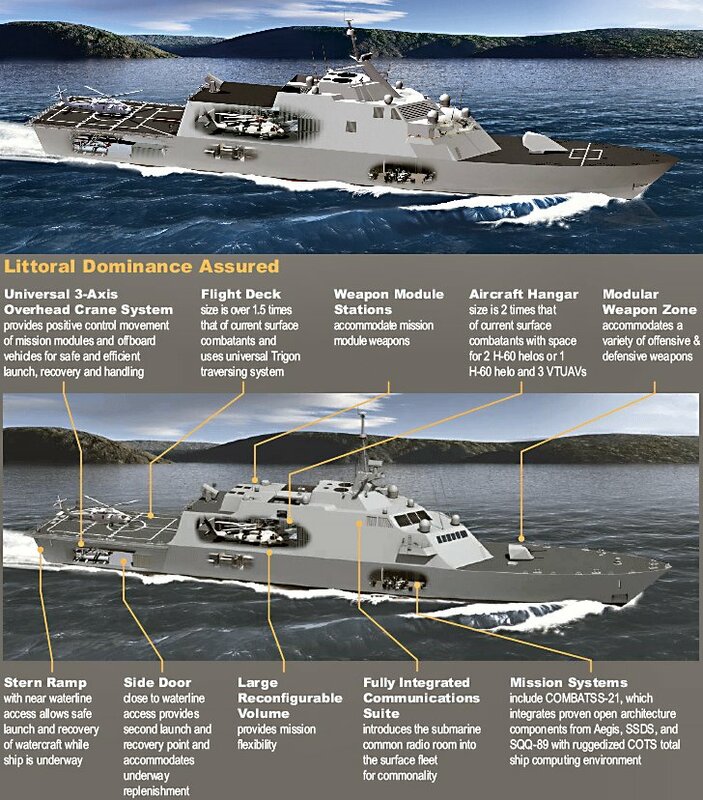 Milwaukee fired four Longbow Hellfire missiles that successfully struck fast inshore attack craft targets during a complex warfighting environment utilizing radar and other systems to track the targets. 205k 03 October 2018: Baltimore, Md. - The Freedom-class littoral combat ship USS Milwaukee (LCS 5) pulls into Baltimore's Inner Harbor for Maryland Fleet Week and Air Show Baltimore, 03 Oct. Maryland Fleet Week and Air Show Baltimore is Baltimore's celebration of the sea services and provides an opportunity for the citizens of Maryland and the city of Baltimore to meet Sailors, Marines and Coast Guardsmen, as well as see firsthand the latest capabilities of today's maritime services. 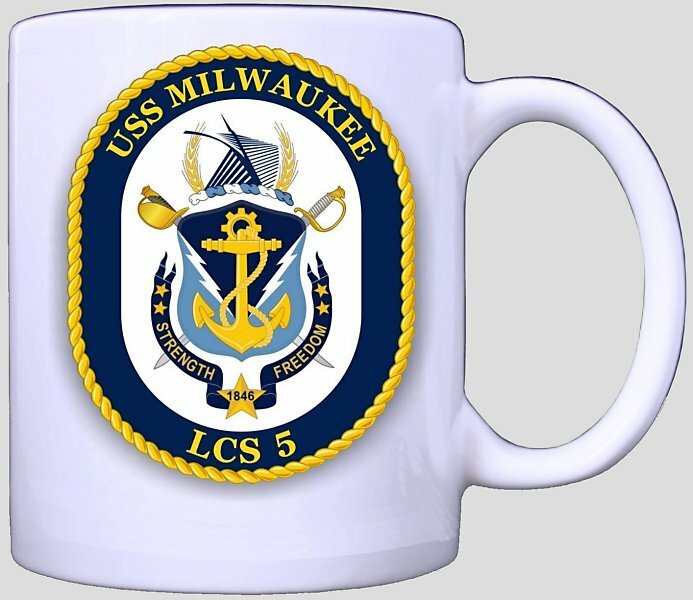 361k 04 October 2018: Baltimore, Md. 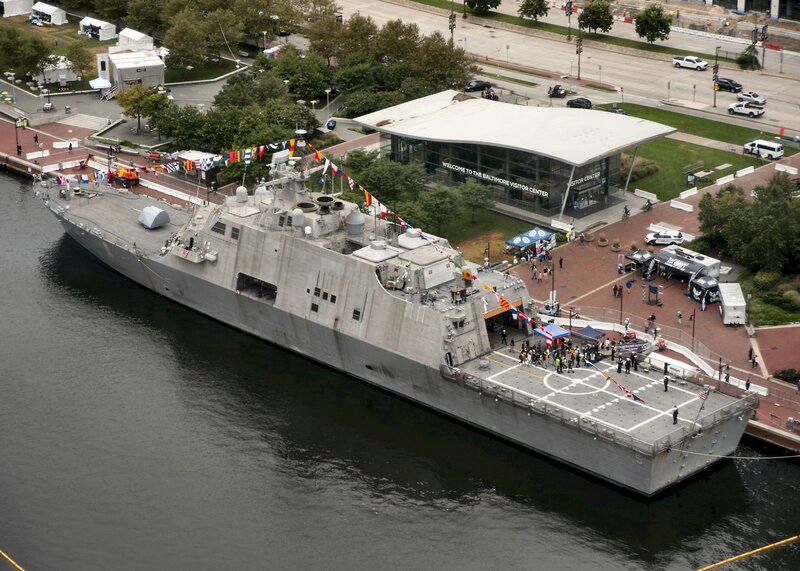 - The Freedom-class littoral combat ship USS Milwaukee is moored in Baltimore's Inner Harbor during Maryland Fleet Week and Air Show Baltimore. 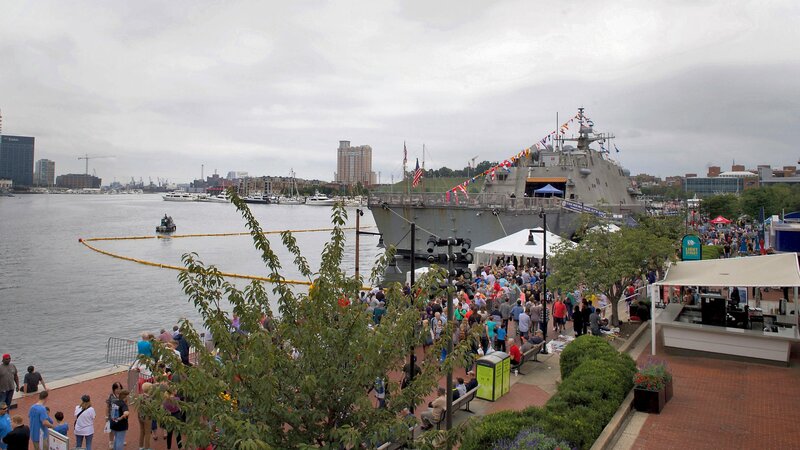 Maryland Fleet Week and Air Show Baltimore is Baltimore's celebration of the sea services. 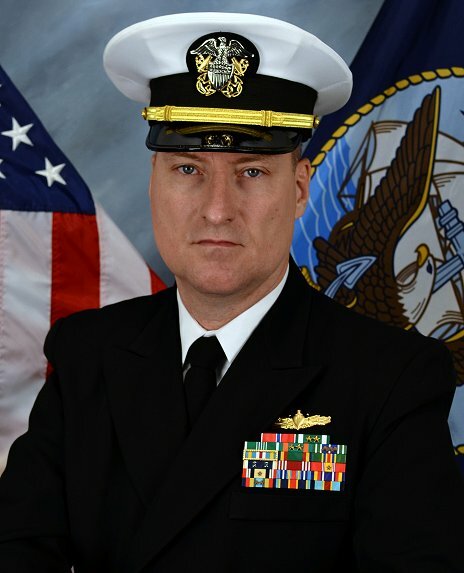 170k 05 October 2018: Baltimore, Md. 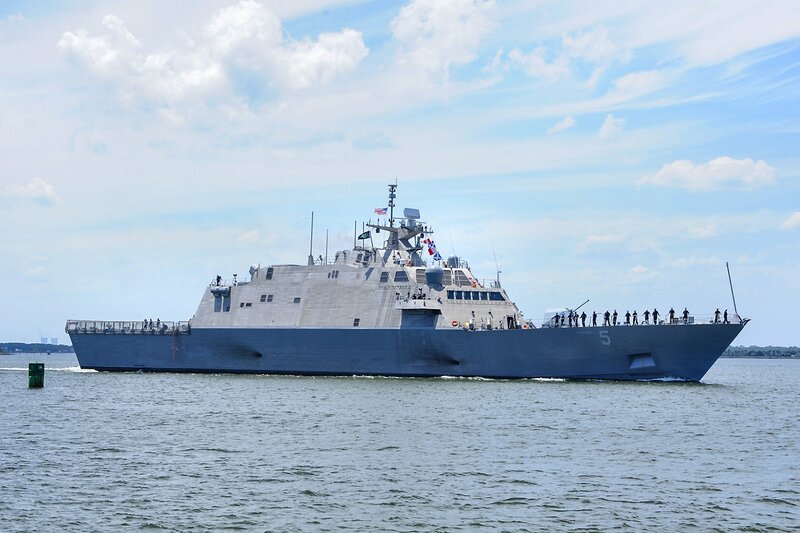 - The Freedom-class littoral combat ship USS Milwaukee (LCS 5) receives visitors during Maryland Fleet Week and Air Show Baltimore. 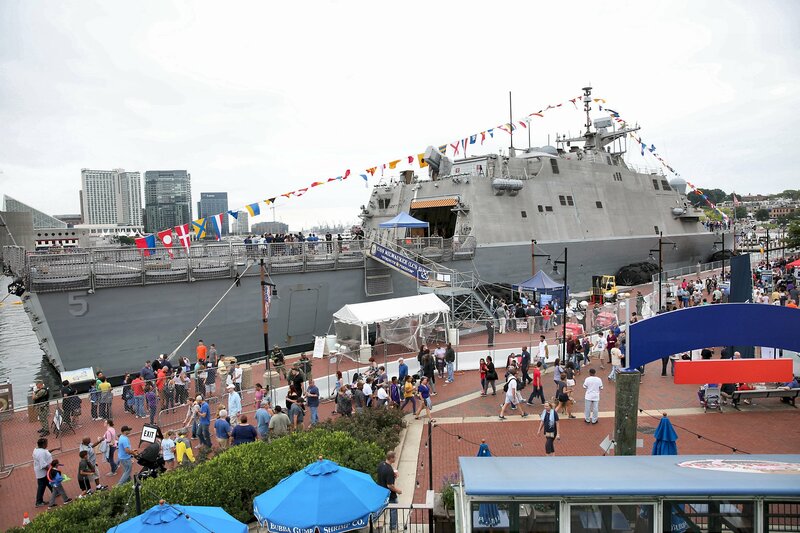 MDFWASB is Baltimores celebration of the sea services and provides an opportunity for the citizens of Maryland and the city of Baltimore to meet Sailors, Marines and Coast Guardsmen. 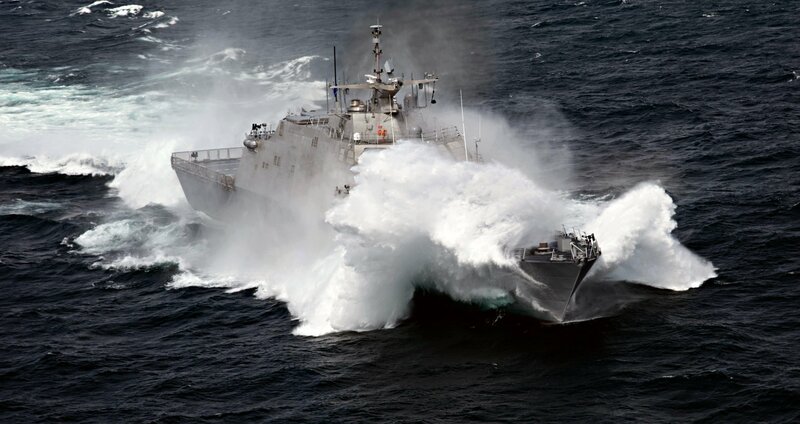 activities without jeopardizing the safety of our sailors or impacting fleet readiness. 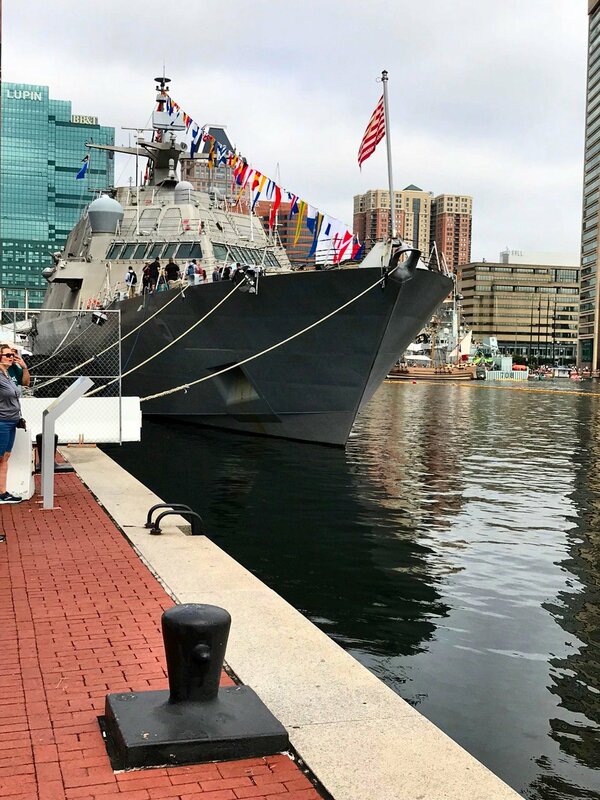 314k 08 October 2018: Baltimore, Md. 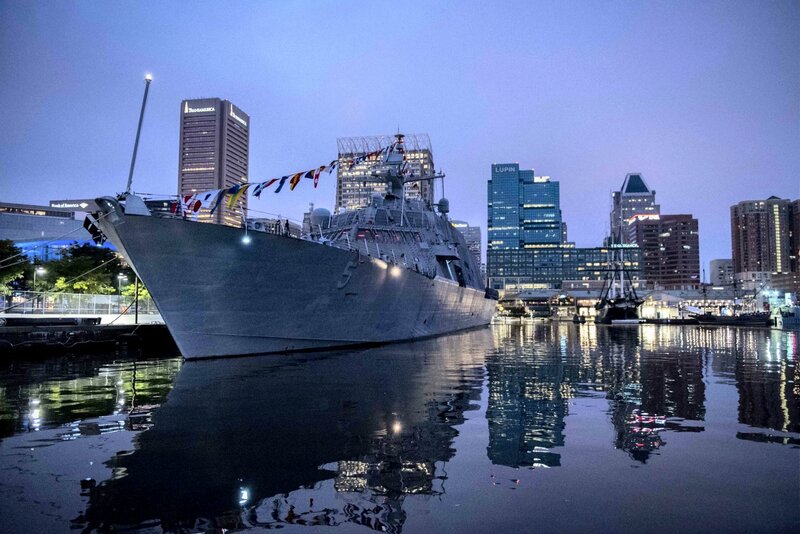 - USS Milwaukee sits moored in Baltimore's Inner Harbor during Maryland Fleet Week and Air Show Baltimore. 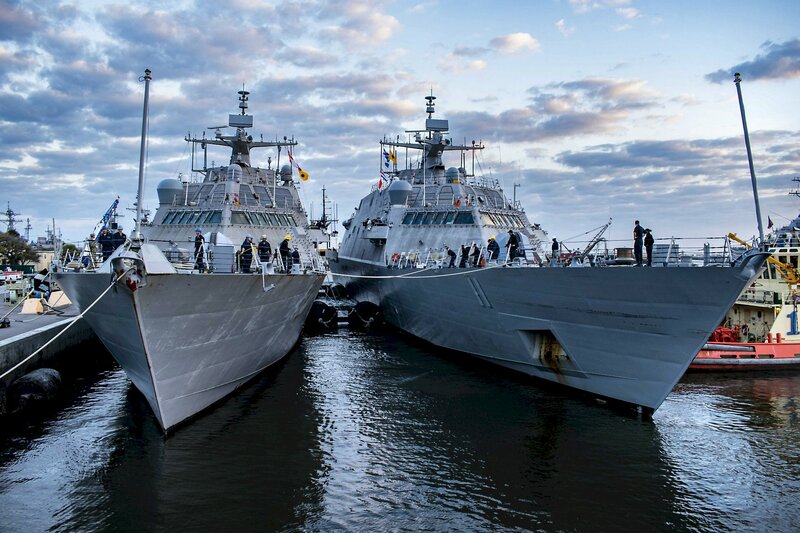 Milwaukee (LCS 5) during a nesting evolution at Naval Station Mayport, Florida. 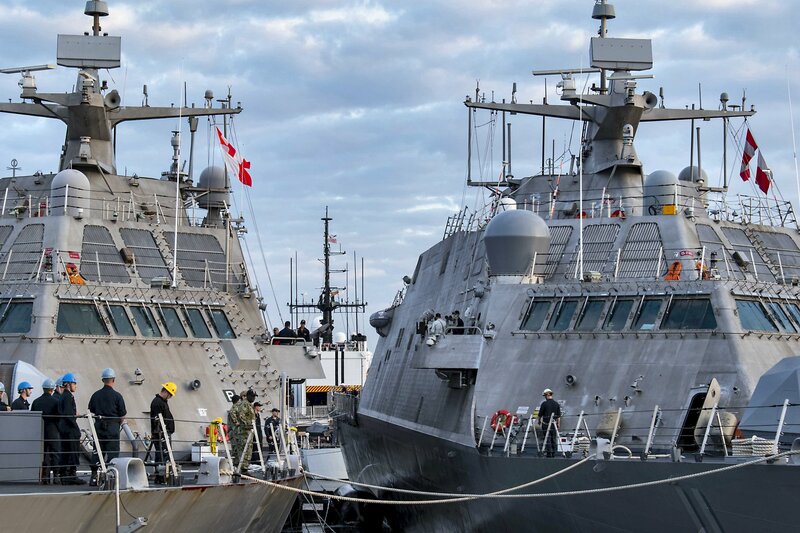 Nesting is when two naval vessels are moored alongside one another due to limited dock space. 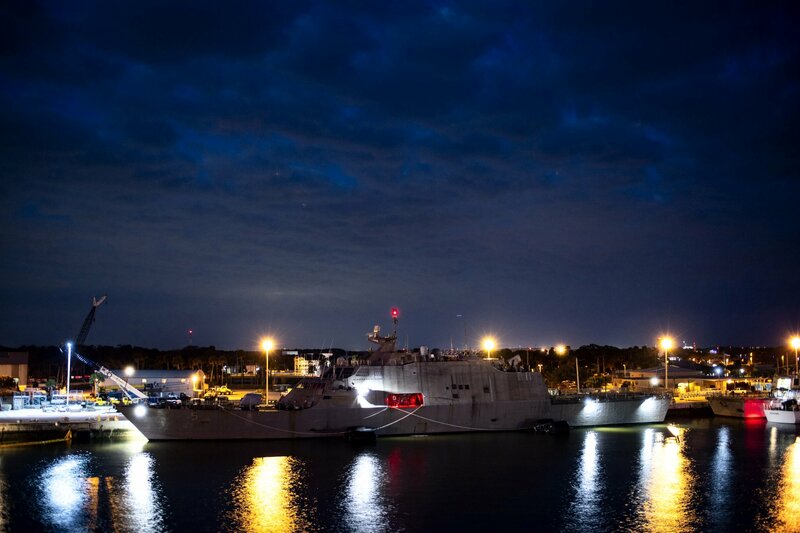 363k 25 March 2019: Mayport, Fla. - A night time shot of the Freedom-class littoral combat ship USS Milwaukee (LCS 5) sitting pier-side in its homeport of Naval Station Mayport, Fla.
View the USS Milwaukee (LCS 5) DANFS history entry located on the Naval History and Heritage Command web site.